Gout is one form of arthritis and it means inflammation of the joints. This happens in those who have arthritis and in 100 patients of arthritis only five are found to be having gout. It is caused due to the accumulation of excess of uric acid in blood, which the kidneys find difficult to remove from the blood. The kidneys usually regulate the levels of uric acid in the body, when this process is compromised, gout can occur. 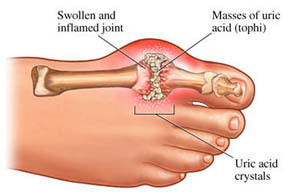 Chronic gout can lead to deposits of hard lumps of uric acid in and around the joints (most commonly found around the fingers, at the tips of the elbows, and around the big toe) and can also lead to decreased kidney function, and kidney stones.This disease mainly happens to men. Big toe is one common area of the body where such gout appears. Once it appears it lasts for about two weeks. The gout can also develop in heels, ankles, knees, fingers, wrists and elbows. There is no pre-indication that gout will arise, one fine day when you get up, you may find that you have gout. The gouts are very painful. There are various reasons for having gout. Due to some injury to joints, due to drinking too much alcohol, due to dieting, due to overeating, post some big therapy or surgery and due to stress, are some of the common reasons for getting gout.Other causes of gout are heredity, alcoholic drinks, regular eating of foods rich in protein and carbohydrate, lack of proper exercise, and stress. Dietary Habits: People who follow a diet that comprises of a high amount of red meats, oily fish, yeast and internal organs are very susceptible to gout. A regular or high intake of alcohol, particularly beer, is also known to increase the risk of developing gout. Heredity: A family history of gout puts you at high risk of developing gout. Although there may be little that you can do to correct this, following a gout diet or exercising some amount of caution when it comes to diet and alcohol consumption could make a huge difference. Age and Gender: Men tend to be more susceptible to gout at an earlier age because uric acid levels rise at puberty in men, while in women this occurs only at menopause. Avoid alcohol and smoking, as they can precipitate the conditions of gouts. Do not keep your joints fixed in one position for a long period of time. Maintain some amount of movement in them all the time. Most important of all preventions for gout is to keep the weight under check. This keeps your digestive system working fine and ensures proper expulsion of the waste products from the body. A warm-water enema should be used daily during the period of fasting to cleanse the bowels. Epsom salts foot baths are advised twice daily. About 250 gm - 500gm of these salts may be added to tolerably hot water for this purpose. Full Epsom salt baths should also be taken three times a week. The baths may be reduced to two per week later. Cold packs applied to the affected joints at night, will be beneficial. Fresh air and outdoor exercise are also essential. The patient should eliminate as much stress from his life as possible. As there is a saying that an apple a day keeps the doctor away. We can trust apple to keep also the Gout away. A person with gout complaints must eat at least one apple per day for obtaining relief. Drinking 6-8 ounces glasses of fluid a day not only reduces gout attacks a day but also wash out the urate crystals from the system and prevent you from developing kidney stones. One of the important home remedies to treat Gout is to soak a piece of white flannel cloth in warm castor oil and place it over the affected areas. Try to move the painful joint, this will increase the blood circulation in this area, thus give some relief form the inflammation of the joints. If you have got gout on big toe then put your feet in Epsom salt. Epsom salt is very effective in reducing the pain. Epsom salt is very good source of magnesium which is very useful in reducing the aching. Hence many old people still soak their feet in Epsom salt once in a while. This is one of the very effective home remedies for gout. The fruits that are rich in vitamin C like, strawberries and food items that are rich source of magnesium, potassium, iron and zinc like, nuts, grains and seeds are also helpful as they neutralize the uric acid and thus assure fast recovery form gouts. Cherries are also very effective in neutralizing the uric acid. You can also have cherry juice every day, as this will cure the gouts fast. Keep yourself active by doing exercises or Yoga. Go for daily walks and there is no better option for good health than jogging. Whatever form of being active you like, you can follow that. As all these things will make your joints strong and also make help kidney to perform better. Bananas have been found beneficial in the treatment of gout. A diet of bananas only for three or four days is advised for providing some relief from gout. A patient can take eight or nine bananas daily during this period and nothing else.